According to Presiding Justice Arthur G. Scotland, the Court decided that the time had come to encourage interested individuals to attend argument and learn first hand how appellate courts operate. Justice Scotland said, “We chose to hold court in a school setting so that we could make it an educational opportunity for students.” The program has garnered statewide recognition. In January 2002, the Court was awarded the Ralph N. Kleps Award for Improvement in the Administration of the Courts. 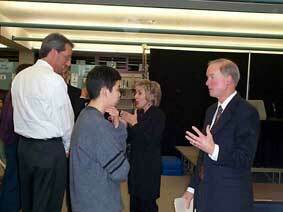 The program consists of two day-long sessions at a public high school in the District. On the first day, Presiding Justice Scotland provides an overview of the appellate process to teachers and students studying American government. The justices then hold a question and answer session. Some of the questions previously asked by students have included the requirements to hold office as an appellate justice, the confirmation and retention of the justices, the applicability of search and seizure laws to students, and how the justices balance their professional and family lives. 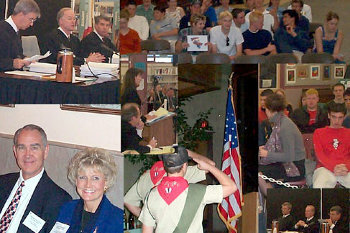 On the evening of that first day, the local bar association usually hosts an educational and social event. Justices and Court staff attend along with local government officials, judges of the local trial court, and various members of the legal community. On the second day, a panel of three justices hears oral arguments in appeals that are actually pending before the Court. These proceedings take place at the high school before students, teachers, and the general public. Occasionally, more than one high school has taken advantage of this educational opportunity by transporting students to the site to observe the proceedings. Copies of the briefs and a synopsis of the appeals are provided to the schools in advance to assist the students and teachers in understanding the arguments, questions, and comments of counsel and the Court. 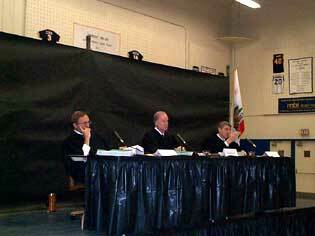 At some point during the day, the Court conducts a question and answer session. Those in attendance are invited to ask questions about the appellate process and the role of the courts of appeal in our system of government. Questions are not permitted about the specific appeals heard by the justices. However, copies of the opinions issued by the Court on the appeals heard that day are forwarded to the participating high schools.